Massey Ferguson’s state of the art MF 5713 SL tractor has won a Technical Innovation Award at this year’s Royal Highland Show. The prize is in recognition of its industry leading ‘All-in-One’, AGCO Power 4.4 litre four-cylinder engine system – which uses the latest Selective Catalytic Reduction technology to meet strict Stage IV/Tier 4 Final emission regulations. The award, sponsored by Hillhouse Quarry Group, will be presented by The Royal Highland and Agricultural Society of Scotland (RHASS) on Saturday, June 25. Lindsay Haddon, Massey Ferguson’s Advertising and Sales Promotion Manager, continued: “We’re delighted to receive the RHASS Technical Innovation Award for our new, All-in-One engine system. 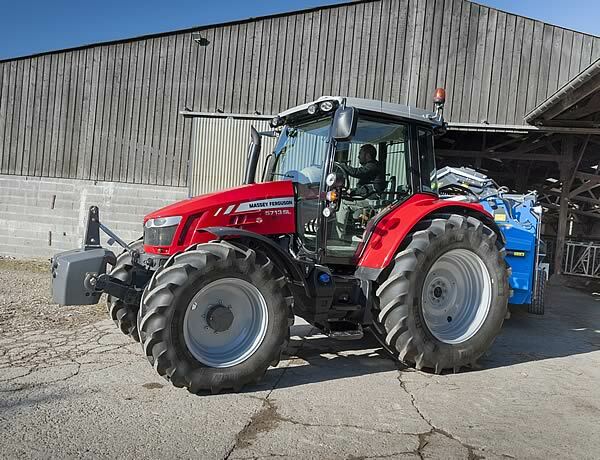 “We're very proud of the design of both the MF 5700 SL Series tractors and their state of the art components. “The unique features of the highly compact and straightforward ‘All-in-One’ engine system mean that the operator enjoys maximum visibility from the cab over a low swept bonnet and slim exhaust, while also benefitting from lower running costs thanks to greater fuel efficiency and efficient use of power – making the MF 5713 SL a leader in its class. Launched last year, the highly versatile MF 5700 SL Series tractors are available in four models ranging from 100hp-130hp. With a 2.55m wheelbase and weighing just 4.8t, they combine a great power to weight ratio with superb agility – ideally suited to a wide range of duties for livestock, mixed and arable farmers. The advanced AGCO Power 4.4 litre, four-cylinder engine employs the unique, maintenance free, ‘All in One’ Selective Catalytic Reduction (SCR) system together with Diesel Oxidisation Catalyser (DOC). The technology uses a special ‘swirl’ system to thoroughly mix the exhaust gases and Diesel Exhaust Fluid (DEF) to help meet Stage IV/Tier 4 Final emission regulations. The highly compact unit tucks neatly away under the right-hand side of the cab, creating a slim, steep-nosed, sloping bonnet that offers superb visibility and manoeuvrability without sacrificing power and efficiency. The MF 5700 SL range includes a choice of renowned Dyna-4 or Dyna-6 transmissions, with brake to neutral function to help make light work of loader applications. A Massey Ferguson designed and built front axle suspension option is also available. The tractors come with a unique choice of three hydraulic systems that offer high flow rates and comprehensive control to suit every application. All models are equipped with an efficient two pump system that delivers 58 litres/min for the spool valves and linkage, with a separate pump for all internal services. For those requiring extra flow to boost loader performance there is also a 100 litre/min combined flow option. A 110 litre/min closed centre load sensing (CCLS) system is another option – delivering flow and pressure on demand for optimum output, control and economy. The MF 5700 SL Series benefits from the same cab comfort as larger models and provides sophisticated but straightforward control. A new Speedsteer option makes it possible to vary the number of steering wheel revolutions needed to turn the wheels from lock-to-lock – helping with loading operations and ensuring headland turns can be made quicker and with less effort. An Auto-Guide 3000 automatic steering option is available as well as the AgCommand telemetry system. The recently introduced ‘Go Mode’ on Auto-Guide 3000 also enables users to choose between four steering paths.